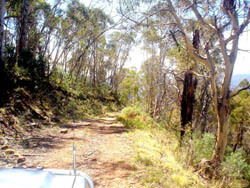 This track starts from the Elliot Way between Tumbarumba and Cabramurra and ends at Talbingo . This track involves crossing "Private Land"... (Through Access allowed)... so please leave any gates as you find them. The track can be a bit tricky after rain and would require you carry any recovery gear you may have if you attempt to do this track alone. There are some very good views along this track overlooking the Talbingo Dam. You will also encounter many Brumbies in this area so drive carefully. About two thirds of the way along this track you will see a sign off to your feft going to Buddong Falls. Its not very far off the main track and is well worth your while. There is a picnic area at the falls and a small area to park your vehicle. The walk to the falls is not far from the picnic area and is fairly easy. Go back the way you came, to the main track and head down to Talbingo. At times you will think your not on the right track but bear with it. There is a very long steep and winding track as you get close to Talbingo so take care as there are some narrow spots here. You will come out through more "Private Property" and shortly after you will come to a real road again. Follow this road to the left and down to the Talbingo Power Station. There as some nice viewing here. After the Power Station, head on to Talbingo where you will see a few picnic spots on the left along Jounima Dam. Talbingo has a small shopping complex and you can get fuel at the Service Station on the main road. There is also a Caravan Park, a Club and Golf Course here. There is also a small, well maintained Airstrip between the township and Jounima Pondage where military aircraft (Carabou and UH-1 Huey) have use it for training exersises. Its not uncommon to see RAAF fighters flying at very low levels doing dummy attacks on the Dam walls. These can be seen best when Traveling between Talbingo and Tumut. Heading out of Talbingo you will reach the Snowy Mt Highway about 2 Km on. Turl Left to go to Tumut traveling along side the magnificent Blowering Dam or turn Right to Kiandra, Adaminaby and Cooma.